As you all know, it is hot here in Woodstock, Georgia. Although summer does not officially begin until June 20th, temperatures are already reaching near the 90’s on a daily basis. This is a great time to not only remind you to stay hydrated but also to keep your plants hydrated! Just like you get thirsty, so do your plants. If you are one of Hutcheson Horticulture’s customers, you really do not have to worry about anything because we will maintain your garden and lawn, but if you are not a customer yet, check out some of these watering tips to ensure your plants are getting all that you provide! Tip #1: Focus on the roots: The roots are the part of the plant that will actually benefit from water, not the leaves. Wetting just the leaves is a waste of water, and can actually cause your plants to become diseased. 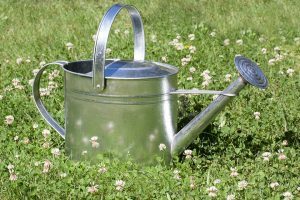 Tip #2: Water when needed: If it has been raining every day, you probably do not need to water your plants, as you could be overwatering them. Sprinkler systems are great, but because most of them do not have any indicator to tell you when water is actually needed, it is important to be attentive to this. Tip #3: Water in the morning: As previously mentioned, it is the roots, not the leaves that actually need the water. Moist leaves can actually cause disease or infection in your plants, which you do not want. By watering in the morning, the sun will have time to dry up any excess moisture you get on the leaves, lessening the chance of them getting sick. Happy gardening, and remember to contact Hutcheson Horticultural if you need us!